Welcom e to the program that lets you choose from 6 million rewards just for using your card. Choice Rewards can be redeemed for gift cards, travel, merchandise, statement credit and much more! There are no limits on the types of purchases. So use your Platinum Rewards or World MasterCard when you dine out, fill up at the gas station or tackle your shopping list. You’ll be rewarded for buying what you need. 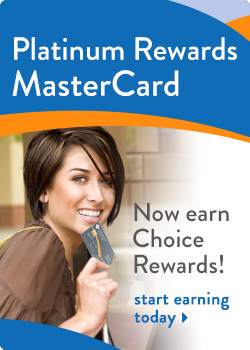 Apply for a Platinum Rewards MasterCard or World MasterCard today! Member Reward Club members receive up to 5,000 bonus Choice Reward Points when they open a new credit card account. Click here to learn more about Member Rewards. Cash advances and balance transfers do not earn Choice Rewards.